Colouring books. They're everywhere. They've taken over bookshops across the world, and colouring pencils can't be made fast enough to meet demand. But what do they have to offer students and maths lovers? At my previous school, after re-discovering colouring books myself one lazy summer, I started a colouring club. I purchased a couple of animal-themed colouring books (everybody likes animals) with a focus on images that employed repeating pattern and/or symmetry, as I wanted to include a maths theme. I also found a great 'Ultimate Dot-to-Dot' book. I cut the pages out and kept them in a folder, in plastic pockets, and simply photocopied the designs as and when the students selected them. That way I kept the originals as 'masters'. I have to confess that initially I rather stereotypically imagined that it would be a club that only appealed to girls, but the reality surprised me - the majority of the 12 or so regular attendees were boys from Years 7 and 8, many of whom also coloured at home. And it was boys that told me "This is the best club ever! Can you run it every lunchtime?!" They were in charge of getting out the coloured pencils and the folder of colouring sheets, and then they sat down, coloured in, and chatted happily all lunchbreak. So, it was an absolute success, and apart from a little organisation at the start of the year, took no planning at all on my part (result!). If you would like to start your own colouring club you are welcome to use this editable poster to advertise it (click on the middle image for the file; you will need to download the free font 'Back To School'). But what if you like your colouring even more mathematical? 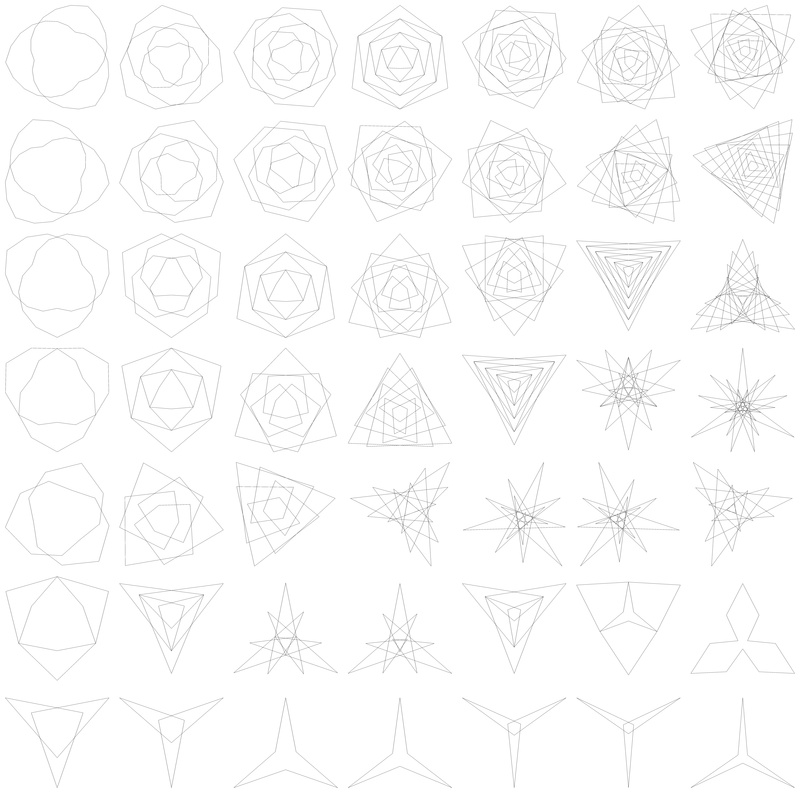 Well, there are several beautiful, maths-themed colouring books out there, as well as several free resources which I will detail in the next section. Perhaps the most well-known of these books is Snowflake Seashell Star (below, entitled 'Patterns of the Universe' in the US) by Alex Bellos and Edmund Harris. It's a lovely book, chock full of beautiful mathematical patterns, and is divided into two sections: a section of images to colour in, and a set of instructions and templates allowing you to create other patterns, such as an Ulam spiral and a hyperbola, yourself. There is also an index with further information on each type of pattern. This makes it informative as well as recreational; one to treasure. Another good colouring book is The Golden Ratio Colouring Book, by Steve Richards (above left, and right). This consists of a series of decorative designs based around patterns formed from the Golden Ratio and Fibonacci Spiral, as well as other mathematical patterns such as the Vesica Piscis, the Flower of Life and the Koch snowflake. And we mustn't forget the wonderful Altair Design books that many of us will remember from childhood. 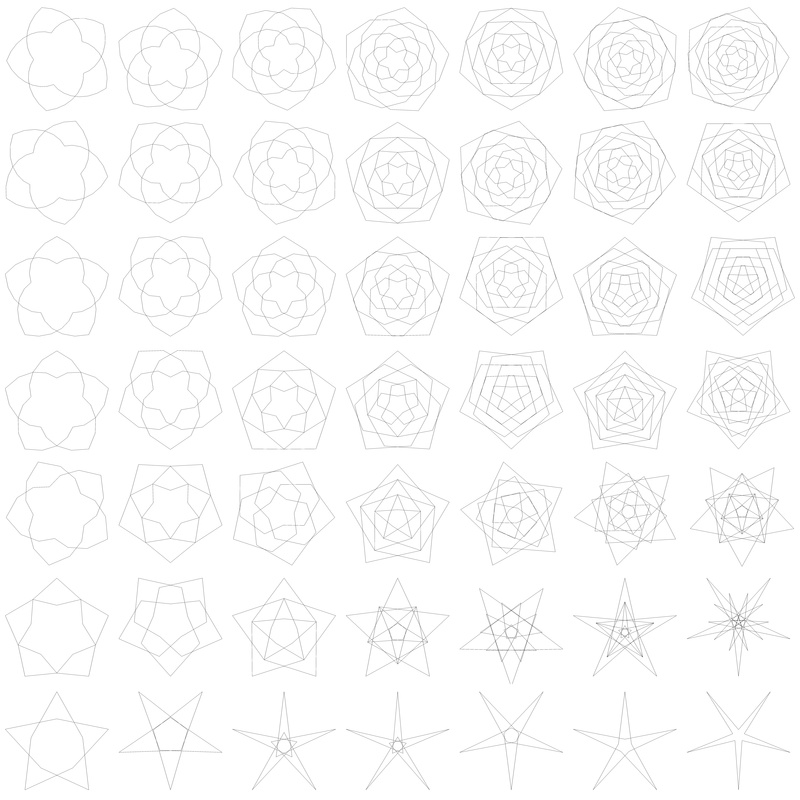 These have been updated to include patterns based on Islamic geometry, Penrose tiling and sets of colourable postcards. The images below were coloured by my mum, Judith. However, there really isn't any need to spend money on mathematical colouring books if you don't want to; some very generous and creative souls have shared beautiful mathematical images for you to download, print and colour for free. The first of these is a beautiful downloadable colouring book by Marshall Hampton, aptly named A Mathematical Colouring Book. It is a really high quality text, full of elegant mathematical curves and patterns (see below), with a short description of each figure at the end of the book. A great addition to any colouring collection! Martin Holtham (@GHSMaths) has used his amazing Desmos skills to create a set of stunning colourable images which he has shared on his Mathemart blog here. I particularly like his 'curve of pursuit', left. If you would like to learn how to draw these beautiful spirals yourself there is a set of instructions on my Mathematical art lessons page. Finally, the talented Devan Matthews (@devan_matthews), a mathematical artist who works with Microsoft Excel, has shared some of his delicate images online for people to colour. He has also created an intriguing set of dot-to-dot maths art pictures. 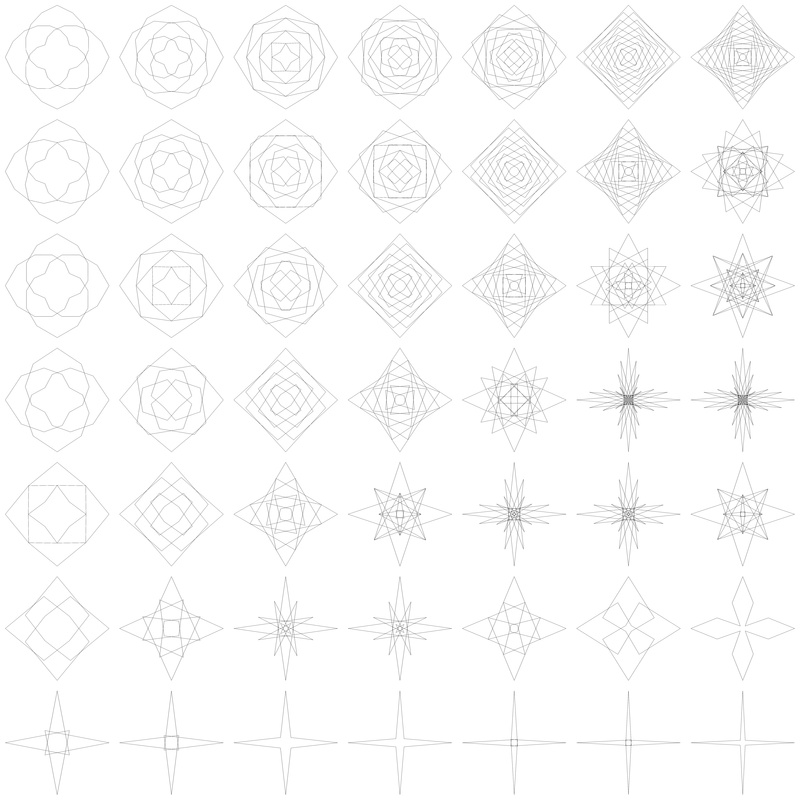 More of Devan's blog posts with delicious geometrical curves and mandalas for colouring. Examples of Devan's work are right and below. I hope you find as much enjoyment in this beautiful selection of mathematical images as I have. Now I know that A-sized paper has some pretty cool properties, so, using the photocopier I reduced an A4 tetrahedron net down through the various A-sizes - and, yes, I made some lovely discoveries (which made perfect sense once I started thinking about it)! Each iteration of A-sized paper decreases in area by half, (so the side lengths decrease by a factor of 1/(sqrt2)): A5 is half the area of A4, A6 half the area of A5, and so on. So the base of an A6 tetrahedron is a quarter the area of an A4 base, meaning that four A6 tetrahedron bases can be packaged in the gap left by an A4 tetrahedron. I played around and found some other combinations (see some examples below). I printed and cut out all my nets, assembled my different sized tetrahedra (step-by-step instructions to follow below) and played around with lots of different arrangements. When finally happy, I stuck them down onto a ready-made canvas. Here are the step-by-step instructions if you would like to try this activity with your students. Tetrahedron net with tabs - SEN Teacher does one here. Print out your 'master' tetrahedron net onto A4, then use the photocopier to reduce this to produce A5, A6 and A7 templates (and A8 if you're feeling brave). I photocopied several smaller templates onto one page, to reduce the amount of card needed. Now photocopy your different sized nets onto stiff coloured paper or card (I used 160 gsm card). Cut out the nets (being careful not to cut off the tabs!). Now 'score' the fold lines by running a ballpoint pen firmly along each line using a ruler. This will ensure the nets fold up easily and give a perfect crisp edge. Next assemble the tetrahedra by gluing the tabs - a tacky but quick-drying glue is best for this. Finally play around with a design built from different-sized, different-coloured tetrahedra, and when happy, stick them onto good quality backing paper (don't use sugar paper as it will soon fade and look tatty), or on to a ready-made canvas (The Works or The Range do large packs quite cheaply). Step back and enjoy your handiwork! I loved my Spirograph set as a child and spent many happy hours exploring the patterns and symmetries I could create with it. And a few years ago, before teaching, I made my own Christmas cards decorated with Spirograph 'snowflakes'. This year I thought I'd give them a go again. I've spent such an enjoyable afternoon, warm and cosy indoors while the rain's been drizzling down, with my little Spirograph set, that I thought I'd share some quick instructions for making these cards so that you can too. You'll need a Spirograph set, or, to use the correct mathematical name, a hypotrochoid set (small ones of these can be bought very cheaply from about £1.50), coloured or metallic pens (I used silver, which catches the light beautifully) and some card. And that's it! (I bought ready-made cards but that's not at all necessary). I teach maths. I'm a bit arty. I like to combine the two. © COPYRIGHT 2016 CLARISSA GRANDI. SOME RIGHTS RESERVED.